I love Dolphin Pose for building strength in the upper body, most especially the shoulders. Continuing to practice the pose will allow you to become stronger in the upper body and core. With added flexibility in the hamstrings and hips, we can begin to have fun with this pose extending the legs for more of a challenge and eventually moving to Dolphin Headstand. 1. Come onto the floor on your hands and knees. Set your knees directly below your hips and your forearms on the floor with shoulders directly above the wrists. Firmly press your palms together and your forearms onto the floor. 2. Curl your toes under, lift your knees away from the floor. At first keep the knees slightly bent and heels away from the floor. 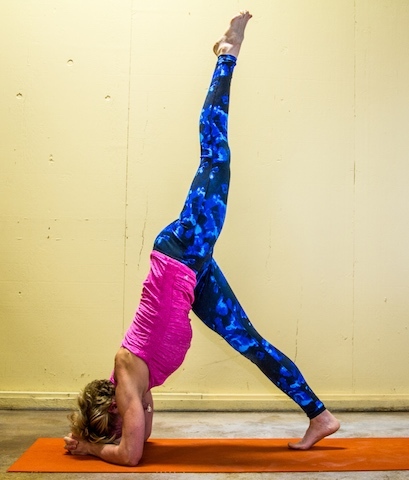 Lengthen through the legs, lifting the tailbone like you do in Downward Facing Dog, then begin to walk feet towards the hands for additional challenge. If upper back rounds, keep the knees bent. 3. Continue to press the forearms actively onto the floor. Draw your shoulder blades against your back, lift the shoulders up away from the ears. Hold the head between the upper arms, don’t let it hang or press against the floor. 4. Hold for 5 - 10 breath cycles. Repeat to build additional strength. Check with medical doctor if you have neck or shoulder injury before trying this pose.